Princetonians loved to joke about Einstein as the absent-minded professor. And absent-minded he could be. Einstein never lost his sense of humor. The year before he died, he was laughing with Griffin over a letter he got from a Catholic priest friend. The priest wrote that he prayed for Einstein every day through the Virgin Mary — and that Einstein shouldn’t mind, since she was a nice Jewish girl. The image is taken from Getty Images. 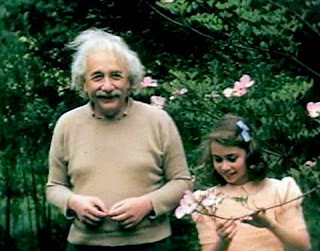 In fact, it is a still from home videos of Einstein in Princeton and is well worth a look.